Get deep, fat sound with Remo Drum Heads.. The Remo Clear Pinstripe Head promotes a deep, fat sound that is great to play in the recording studio or on stage. The Clear Pinstripe Head has 2 plies of clear film that are bonded at the collar. This design dampens excessive resonance and high overtones. The result is a focused, low-end sound with good attack. 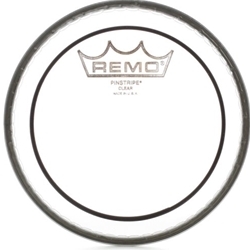 For a controlled, deep sound, the Remo Clear Pinstripe Head is a great addition.